New Zealand has a reputation for big, bold and beautiful walks – and this isn’t undeserved. Whether it’s a short stroll, a 5-6 hour hike or a challenging 5-6 day tramp, every region of the country has some great offerings. You have the iconic nine ‘Great Walks’ which are on the bucket list of many nature enthusiasts. Others have become Instagram-famous, like Roy’s Peak near Wanaka with its stunning mountain views. But the majority of New Zealand’s offerings remain off the pages of the guidebooks because there are simply too many to count! New Zealand is obviously not the only country in the world which offers great walking opportunities, but what separates it from the rest of the pack is how accessible they are. Most of the world is now a very developed place – truly getting ‘off-grid’ and engaging with nature usually means undertaking a specialist trip to the wilderness. Often, you need to drive for miles! This isn’t the case here. Huge tracts of NZ remain very underdeveloped, so awe-inspiring hikes can usually be found right off the main highway. If you feel like stopping off on impulse to stretch your legs, or because you see one of the ubiquitous ‘scenic lookout’ signs, most walks are very accessible. Many travellers are short on time during their visit or have small children with them, so great big hikes are not appropriate. 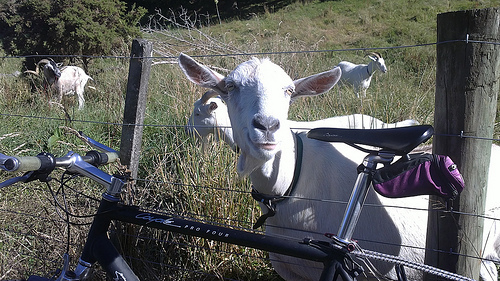 Besides, not everyone has the fitness and legs of a mountain goat! The good news is that New Zealand has a walk to suit everyone! Even the public car-parks off the main highways allow you to take a short easy walk with a fabulous view. These walks are often in a loop formation, so you return where you begin without having to retrace your steps. 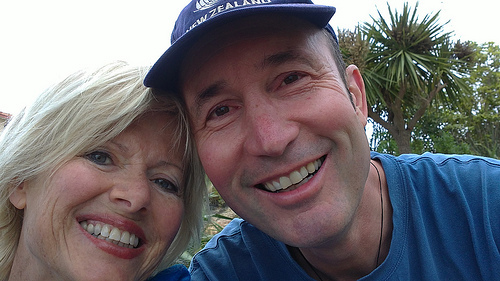 We discovered the lovely view above at Little Kaiteriteri in the Abel Tasman area of the South Island. If you follow this walk up from the beach, it will eventually lead to Stephens Bay. The best part? We only had to walk 10 minutes to get this view! There are many, many walks like this all over the country, and all have some fantastic photo opportunities. So even if you aren’t someone who is super into walking, there are still options for you! Most of these walks are clearly signposted from the road, so you can break up a long day with frequent stops to refresh and stretch the legs. There’s almost always a picnic table and toilet facilities conveniently placed at the start of the walk, and if you’re REALLY lucky, a big chair! 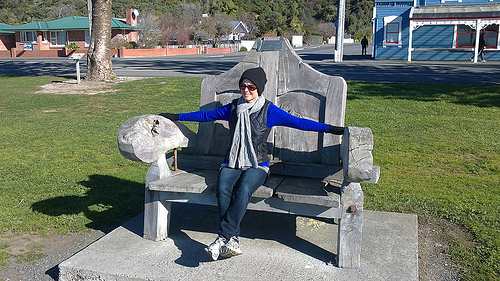 New Zealand has a very quirky sense of style, and you’re bound to come across some fun outdoor sculptures during your travels. Is a beach stroll more your thing? No problem! As an island nation, New Zealand has over 9000 miles of coastline. This varies from the white sandy beaches of the Far North to the craggy, stark beaches that make up a lot of the South Island. Choose a coastal road anywhere, and you will get your dose of surf and sand. There is plenty of room for all! Even in the height of the summer, you can find your own little piece of paradise devoid of people. There are bush walks galore in this fabulous little country. Many of these are run by DoC (Department of Conservation) who are in charge of maintaining the tracks. They are clearly signposted and provide clear signage all the way along trails, so there is little chance of going astray. It’s worth checking out their online guide for walks throughout the country. This will help you to get an idea of what is available at each point in your journey. If you are wanting to visit somewhere with a range of options, the Fiordland region offers a range of outstanding short and medium length nature walks. Virtually the entire area is national park designated, meaning that it caters well to a range of abilities. 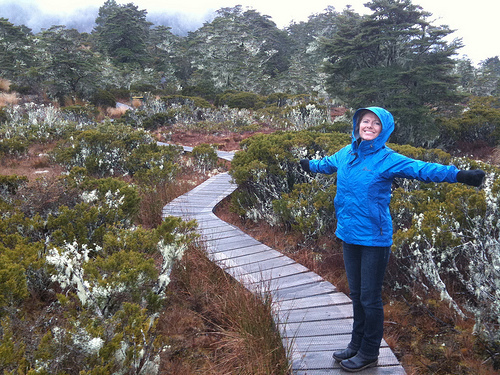 A great choice for families with small children is the Rainbow Reach section of the Kepler Track. The Kepler is one of the nine New Zealand great walks, meaning that it is designed for high foot traffic. The track is wide and very well-maintained, and you will walk through some incredible native forest for the 2.5-hour duration. The track begins at the Kepler Track carpark, which is the southern end of Lake Te Anau. Some of the filming for the Lord of the Rings trilogy also took place here! 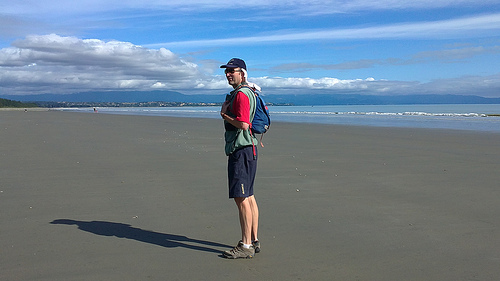 Another big favourite is the Gillespie Beach Walk, which starts about 25 km from Fox Glacier on a gravel road. It has some incredible alpine views, and contains various tracks down the coast. The best thing about this walk is that you can make it as long as you want; whether you want a quick 10-minute stroll of a hike of a few hours, simply turn around when you feel like it! If you think that you might want to do a spot of walking on your visit to New Zealand, it’s better to be safe than sorry in your preparation. Important: If you are going out for a longer hike, make sure that someone knows where you are and what you are doing. This could be your accommodation host or even your family or friends at home; anyone who can alert services if you aren’t back at the appointed time. Otherwise, no one will know whether you are missing or not! If you are doing a hike in any of the national parks, there will be an office somewhere that you can report to. This is also a good place to get practical information such as weather forecasts and high/low tides. …and last but certainly not least, no walk is complete without a shameless selfie! Happy hiking everyone! For more information on other nature-focused activities in New Zealand, see our nature and lifestyle itineraries.